In conversation with Josh Hecht, Dominique Dibbell and Jen Lanier at Profile Theatre. July 2018. Moderator, Time-Based Art Festival Dialogue with Raquel André and Andrew Schneider. Portland Institute for Contemporary Art. September 15, 2018. Panelist, "Comedy in the Time of Resistance." Profile Theatre. July 1, 2018. Panelist, Time-Based Art Festival roundtable on Dance Dramaturgy. Portland Institute for Contemporary Art. September 9, 2017. Moderator, Time-Based Art Festival Dialogue with Royal Osiris Karaoke Ensemble. Portland Institute for Contemporary Art. September 13, 2016. Lecture, "Radical Crossings: How France Canonized the American Avant-Garde"
Institute of Performance Studies at Yale. New Haven, CT. April 23, 2016. Moderator, Time-Based Art Festival Dialogue with Philippe Quesne. Portland Institute for Contemporary Art. Portland, OR. September 18, 2015. 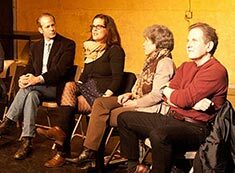 Guest lecture and discussion, Four-hour class for audiences on Christopher Durang’s Vanya and Sonia and Masha and Spike. Portland Center Stage. January 24, 2015. In conversation with Antonie Defoort and Halory Goerger at PICA. September 2014. Moderator, Time-Based Art Festival Dialogue with Halory Goerger and Antoine Defoort. Portland Institute for Contemporary Art. Portland, OR. September 19, 2014. Panelist, "The Master-Mistress of Our Passion: Gender and Sexuality in Shakespeare." Artists Repertory Theatre, Outwright Theatre Festival. June 23, 2014. Milagro Theatre, as part of "Identity Boot Camp." May 18, 2014. Introduction, Guillermo Caldéron staged reading and discussion. Convened by Boom Arts. Reed College Performance Lab. April 22, 2014. Guest lecture, "Dramaturgy in Academia." Yale School of Drama. New Haven, CT. April 11, 2013. Panelist, "Making Sense of New Performance." Risk/Reward as part of the Fertile Ground Festival. ART. Portland, OR. January 27, 2013. Panelist, "Shakespeare in the 21st Century." Portland Experimental Theatre Ensemble. Fertile Ground Festival, The Headwaters. Portland, OR. January 27, 2013. With Michael Mendelson, Lue Douthit, and Stephen Weeks at the “Shakespeare in the 21st Century” panel. Panelist, "The Age of Jackson." In conjunction with Portland Playhouse's production of Bloody Bloody Andrew Jackson. Convened by Boom Arts. Portland, OR. October 20, 2012. Norman Armour (PUSH Festival), Ron Berry (Fusebox Festival), and Zvonmir Dobrovic (Perforacije Festival). Portland Institute for Contemporary Art. Portland, OR. September 11, 2012. Panelist, "26 Statements RE John Cage." Blackfish Gallery. Portland, OR. September 5, 2012. In conjunction with Portland Playhouse's production of Angels in America. Convened by Boom Arts. Portland, OR. December 11, 2011. With Ruth Wikler-Luker, Brian Weaver, and Wayne Miya at the “Angels at Twenty” panel. Lecturer, Dramaturgy and new play development. Hollins MFA Playwriting program. Roanoke, VA. July 15, 2009. MFA Dramaturgy program. DePaul University, Chicago, IL. March 13, 2009. Guest lecturer, On production dramaturgy and the adaptation process. DePaul University, MFA Dramaturgy program. Chicago, IL. October 24, 2008. Talk, "'Actual and True and Ugly and Painful': the Theatre of Sarah Kane." University of King's College. Halifax, NS. April 5, 2008. Talk, "A Country Road. A Tree. Evening. Godot at San Quentin and in the Lower Ninth Ward." University of King's College. Halifax, NS. January 19, 2008. Talk, "Le Bourgeois Gentilhomme: Molière, Lully, and the comédie-ballet." Dalhousie University. Halifax, NS. March 27, 2007. "Shakespeare" photo by Portland Theatre Scene. “Angels” photo by Boom Arts.